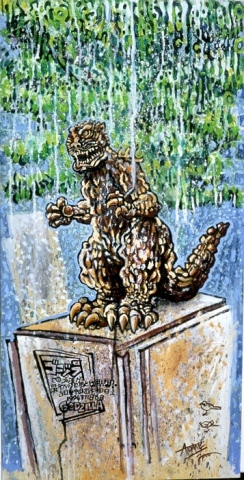 After they granted America the license to do their own Godzilla movie, Godzilla was killed off in the Toho series. This statue, ironically placed outside McDonalds in Hanzomon, is his memorial. People leave offerings of low denomination coins under his feet, and lit cigarettes in his open left claw. Despite not smoking cigarettes I did ponce a fag off a bystander and light it up for the big G.
The style of the painting is an attempt to evoke the heat and humidity of Japanese summer.